Before students can take an assessment, it must be published. To set the options click on the settings icon to the right of the dates. You may also define the settings of your assessments when you click on it to edit it. It’s right below the title. Once an assessment is published, you can unpublish it at any time, even after submissions have been received. When you unpublish an assessment, it will be removed from the student list, grading view of AT&S, and the gradebook. Check the box to the left of the assessment and then click on the Publish icon on the action menu. This will add a green check to the left of the assessment, indicating that it is now published and available to students. They can see it in their view, though they may not be able to access it, if it is not yet open. You may check and publish several or all assessments at the same time by using the “Publish” button. Alternatively, you can click on the gear / settings icon to the right of the dates, adjust the settings for your assessment and click on Publish at the bottom of the settings view. This workflow is the recommended path for publishing new assessments, as it invites you to think about the presentation and delivery settings for your assessments prior to publishing them. Once you have administered the assessments a few terms and you have solidified the desired settings, then following the publication process under #1 is more efficient. Regardless of what process you follow, you can change all settings and make revisions to assessments after they are published. Most changes are allowed, with the exception of adding or deleting questions and parts. The settings listed in the section below can be altered at any time, even after submissions have been received. For example, if you change the due date or the number of tries allowed, the changes will be reflected in all students’ views, whether they’ve submitted the assessment or if they have not yet started it. At the top of the publish settings page, you can select an assessment ‘type.’ Your choices are Test, Assignment or Survey. The ‘type’ for an assessment can be set in this view or when adding / editing an assessment. You can change a “Test” to “Assignment” and vice versa, or to “Survey” type at any time, even after students have begun submitting tests or assignments. However, you cannot change a “Survey” to another type, as surveys are by design anonymous and permitting them to be changed would compromise the integrity of the anonymity, as “Tests” and “Assignments” reveal the names of submitters. Delivery dates can be set on the Assessments list page or the publish settings page. The easiest way to set your delivery dates is to use the calendar widget. If you want to establish a grace period within which students can submit work late, you can enter an “Allow Until” date that is later than the due date. Submissions will be accepted past the due date and up to the “Allow Until” date, but they will be marked late (“- Late” in red) in Grading. If you leave the Allow Until field empty, assessments will not be accepted after the due date. You may also select to hide the assessment from the student view until the open date arrives. 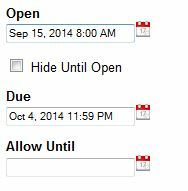 Note: Students do not see the “Allow Until” date anywhere. It is up to you to tell them that you’ve set a grace period. Assign how many tries you will allow students to have. Select Unlimited if there is no limit. If your assessment has a time limit, check that radio button and set the limit. Otherwise, leave it as untimed. If you’re unsure exactly how to insert the time, click on the Instructions link, which will show examples of how to format your time. Click close when you’re done. Students will see a timer bar the minute they click on Begin. It will be displayed in green color, counting down the time remaining. With five minutes to go, the timer bar turns yellow and with 2 minutes to go, it turns red. If students click on Continue Later, without submitting a timed test, they will see the timer bar on their Assessments List. These settings affect what students will be able to see in Review after they submit the assessment. Upon submission shows review immediately after students submit their assessment. Upon release shows after instructor grades and releases graded submissions. After date shows review at a specific time that you set. Never means students cannot see review. There will be no hot link to Review. 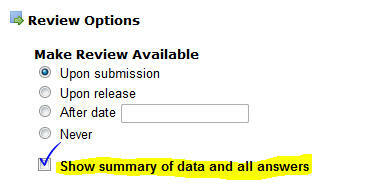 If this option is checked, students will see a link to Summary of Data in Review. 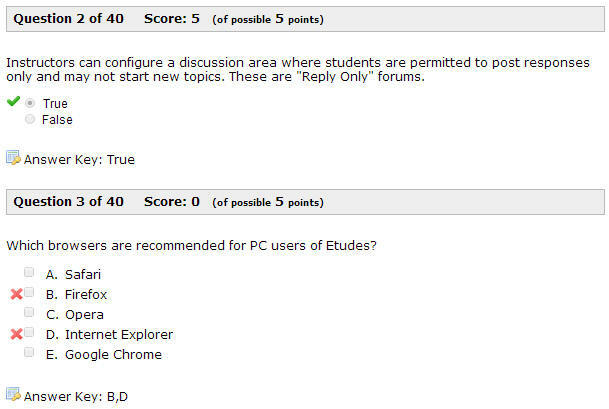 This option is available with “For all answers”, as Etudes needs to display all the questions in order to display statistics on the responses by the class. This allows students how they did in comparison with the rest of the class. Allows students to see which of their answers is correct or incorrect and how they did on each. If students answered a question partly correctly, they can see it with the icons and score. This option will not show the correct answer key nor scores for questions a student missed. Students will only see the questions they missed, with no answer key or score. In the questions that students got right, they will only see the points they earned but not the text of the actual correct questions. Students will only see the questions they missed, with the answer key and the score they earned (if partial). In the questions that students got right, they will only see the points they earned but not the text of the actual correct questions. With this setting, students will not see the answer key, what points they earned, nor what they got right or wrong. Checking this setting allows students to read any additional feedback that you included when authoring the questions. If this feature is enabled, enter a minimum score that students must earn in order to receive a certificate. Students will receive a link to a certificate, with the option to print it. The certificate includes their name, title of assessment, points earned out of possible, title of course and date. This is where you make grading choices for your assessments. Automatic Release means that the assessment will be auto-scored by the system and the results will be returned to students automatically. If there are any essay questions in an assessment and it is set to ‘automatic release,’ students will see the scores of the objective questions, but essays will have to be manually graded. Students will see a partial score for the assessment until you grade the essays and release the submissions. Manual Release means that grades are not returned to students until after the instructor releases them. A combination setting of “upon submission” with “manual release” is a desirable setting for assignments and essays, as it will allow students to review the assessment and what they submitted after they turn it in, even if it not yet graded. 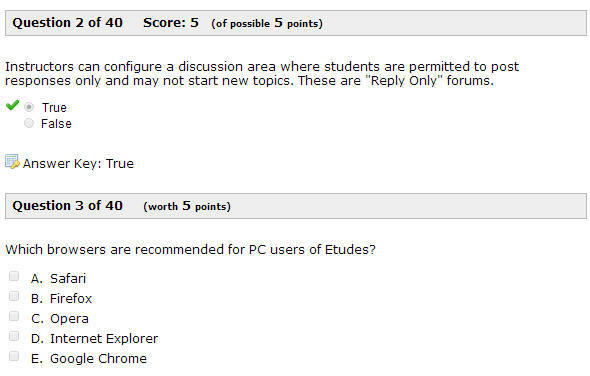 Model Answer is a setting that allows instructors to show a model answer or solution to students in review, after scores and evaluation comments are released. Students can get in to view an assignment and what they submitted immediately upon submission, but the model answer (if the setting is checked and a model answer is provided in the questions) will be shown (optionally) *after* scores and submissions are released to students by the instructor. 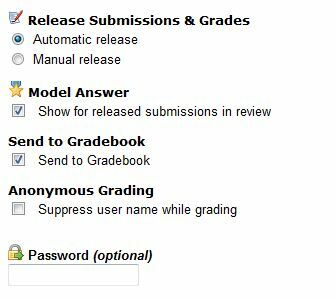 Send to gradebook enters a column for this assessment in the gradebook and sends results to the gradebook. Anonymous grading allows you to grade assessments without knowing which submission was made by which student. This setting can be reversed by unchecking the anonymous grading check box at any time. Surveys are always anonymous and, once published, cannot be reverted to reveal student names. Password is an option for additional security and control of delivery of assessments, possibly at a proctoring facility or classroom. 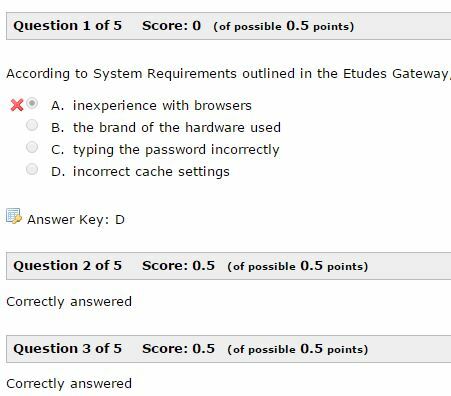 If you include a password, then students must type in the password before accessing the assessment. This is in addition to their standard login into the system. You can define an email address under the Settings of an assessment if you would like to receive the results when the assessment closes. To get emailed results, set an email address in the appropriate field of the assessment, and set a close or accept until date. Once the date is passed and the assessment closes, the email will be sent. Once the results have been sent, the settings view will show the date, and offer a button to “Send Again”. If you are co-teaching, or have TA’s in your class, you may set more than one email address. Separate them with a comma. This does not include attachment submissions. This is for inline submissions and objective exams only. Note: For survey results to be emailed to the recipient, two conditions must be met: a) Due (or allow until) date has arrived, and b) “View Results” under Grading has been clicked. Clicking on “View Results” before the due date arrives will not send an email until the due date is reached. If the due date has passed, clicking on View Results will trigger an email to be sent. The settings in this section affect the presentation of an assessment. They can be changed at any time, even if an assessment is published, has student submissions, or test-taking is in progress. If you require students to accept an honor pledge stating they did not receive nor give assistance, check the box. Once checked, students will not be able to begin the assessment until the Accept the honor pledge. If you want students to see the hints that you included when you authored your questions, check the hints check box and they will be made available to students while taking the assessment. This feature gives you great flexibility in that you can allow hints in low-stakes quizzes, but disable them under ‘Settings / Publish’ when using the same questions in a high-stakes exam. Same questions — different “show hint” option. You have the option to “Shuffle choices” for all multiple choices questions. This can be useful if you had forgotten to check ‘shuffle’ for choices in question authoring. Two navigation options are available. Choose “Flexible Order” if you want to allow students to answer the assessment’s question in whatever order they want. This is the typical navigation setting for assessments, and it is the default. It is learner-friendly, allowing students to work on what they know first. If learners are unsure about the answer to a question, they can mark it for review and return to it later before submitting their work. They can proceed to the next question and return to unanswered questions at a later time. Learners have previous and next buttons to move about and access to a Table of Contents to jump to any questions they want to revisit. They can change their answers. If you choose “Strict Order,” it means that students will be able to see and answer a question only once. Students do not have previous buttons in “Strict Order” assessments, and no Table of Contents. They cannot go back to review answered questions or change their answers. This navigation option is used typically in high-stakes exams. You can select how you want questions to be displayed in your assessment: one question per page, one part per page, or all questions on a single page. If you have several parts on your assessment, choose if you want question numbering to be continuous across parts, or if you want questions to start over at one (1) with the first question of each part. Note: Continuous numbering + no part titles will blend all the parts together, and will show no separate screens when a new part starts. Type in a message you want students to see (if any) once they’ve clicked on Finish and submitted their work. Once you’ve made all your settings choices, at the bottom of the page there is a summary of what your assessment consists of. Click on the Publish button if you’re ready to publish the assessment, or on the Save button if you want to keep the settings you’ve chosen but aren’t ready to publish. Before you click on Publish, it is strongly recommended that you click on Test-Drive to view the assessment from the student perspective and catch and fix any errors in point value or question text before you publish it. Although you can still make changes after students have accessed your assessments, it is best to catch them early, and not make changes on students once they start an assessment.